Crammed with cultural treasures, Canberra, in the ACT (Australian Capital Territory), is the carefully crafted capital of Australia. It's no accident that the city lies between Sydney and Melbourne. The site of the capital was chosen as a compromise between these two rival cities in 1908. American architects, Walter Burley Griffin and his wife, Marion Mahony Griffin, won an international competition for the city's design, which incorporates vast greenbelts and geometric shapes. Lake Burley Griffin, in the city center, is Canberra's sparkling jewel, and many of the city's top tourist attractions and things to do lie along its shores, including the National Gallery of Australia, Questacon, and the National Library. The parliament buildings, as well as some of the city's other main attractions, lie within the Parliamentary Triangle, formed by Kings Avenue, Commonwealth Avenue, and Lake Burley Griffin. Canberra is also known for its fantastic festivals, including the famous Floriade, a celebration of the city's many spring blooms. Inaugurated in the middle of WWII, the massive Byzantine-style monument commemorating Australia's war fatalities is Canberra's most poignant attraction. More than just a war memorial, the site combines an excellent museum, archives, art gallery, and library. The Commemorative Courtyard at the entrance to the memorial is a haunting introduction. 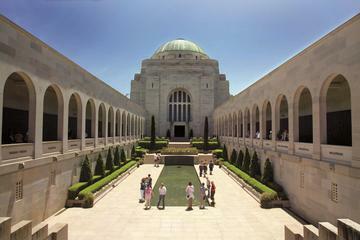 Inscribed in bronze on the walls of the colonnades are the names of every Australian who has died in war since 1885, and the length of the list is spine chilling. Beyond the entrance, different galleries retrace the stories of Australia's armed conflicts from colonial days to the present. The exhibits are constantly evolving, but highlights include the collection of old aircraft and the child-friendly Discovery Zone packed with interactive displays. If possible, you should set aside several hours to appreciate this thought-provoking memorial, and if you're visiting near the end of the day, try to stay for the Last Post, a moving tribute to the fallen played at 4:55pm daily. Visiting the memorial is one of the best free things to do in Canberra, and the 90-minute tours are highly recommended. The final fulfillment of architect Walter Burley Griffin's vision for Canberra in 1912, New Parliament House is a marvel of modern architecture. The boomerang-shaped structure nestles comfortably into Capital Hill and was designed to replace the Provisional Parliament House at the base of the hill, now known as Old Parliament House. A New York-based architect won an international competition for the design of the new building, and on May 9, 1988, the Queen officially opened Parliament House. The date in May was chosen to commemorate the first meeting of Federal Parliament in Melbourne in 1901 and the first meeting of Parliament in the Old Parliament House in 1927. From the expansive grassed walkway, which forms the roof, visitors can enjoy panoramic views of Canberra and see how Parliament forms the central focus of the city's street layout. Architectural highlights of the building include the two huge circular walls composed of granite, which mirror the curves of the hill; the towering 81-meter flagpole; and the Ceremonial Pool. In the foyer, 48 columns of illuminated greenish-gray marble create the impression of a eucalyptus forest. Throughout the public spaces, exhibits display important documents (the Magna Carta is a highlight) and retrace important events in Australian history. From the gallery running around the first floor, you can gain admission to the public galleries of the green-hued House of Representatives, and the Senate, traditionally dressed in red. A visit during sitting times is a great way to view first-hand how parliament functions, and the free guided tours offer fascinating details about the building. After visiting, you can take the 3.5-kilometer Parliament House Walk to the city center and learn about the Parliamentary Triangle along the way through interpretive signs. A short walk from New Parliament House at the base of Capital Hill, Old Parliament House is now home to the Museum of Australian Democracy. Opened by the Duke of York (later King George VI) in 1927, the building is designed in the "stripped classical" style and was occupied by the Australian Parliament until 1988 when New Parliament House was officially opened. It was formerly called Provisional Parliament House, and was only standing in until a permanent structure could be designed and built - a feat finally realized 61 years later. In the museum, you can learn about past Australian Prime Ministers; sit in the old Prime Minister's Office, a relatively humble affair; visit the Press Room; and read important historical documents. The chambers of the House of Representatives and the Senate are modeled on the British House of Commons and House of Lords with paneling and furnishings made of Australian woods and wall hangings displaying Australian flora. Parents will appreciate the child-friendly exhibits. After a visit to the building, you stroll among the National Rose Gardens. Free, guided tours help you get the most out of your time here. Beautiful Lake Burley Griffin is the centerpiece of Canberra. Named for the city's architect, this artificial lake was included in his original plan of 1912, but didn't come to fruition until 1958. Tourists and locals alike come here to bike and stroll along the waterfront paths; picnic along its park-fringed shores; and fish, sail, or paddle the glistening waters. Six islands lie at its center, the largest of which is Aspen Island, home to the National Carillon, a gift from the British government with 55 bronze bells. Sprinkled around the lake are some of Canberra's top things to see and do, including the National Gallery, National Library, Questacon, and National Museum. Standing on the shores of the central basin, you can see the Captain Cook Memorial Jet, a 147-meter-high fountain inaugurated in 1970 on the 200th anniversary of Cook's discovery of Australia. A globe sculpture depicting the path of Cook's voyages lies on the shores of the lake at Regatta Point. On the north side of the lake, Commonwealth Park contains play areas, paddling pools, waterfalls, an amphitheater, and a path round the park. In spring, the park is the venue for the famous Floriade festival, a celebration of spring when more than a million flowers are in bloom. On the shores of Lake Burley Griffin, the National Gallery of Australia contains Australia's largest collection of art. The cubic concrete structure was opened by Queen Elizabeth II in October 1982 and consists of 11 main galleries on three levels as well as a large sculpture garden laid out according to the four seasons. The purchase of the extensive collection began in 1968 and includes works from Australia, Asia, Europe, America, and the Pacific, as well as the largest collection of Aboriginal and Torres Strait Islander art in the world. Mediums range from oil paintings and watercolors, to sculpture, decorative art, drawings, book illustrations, sketchbooks, photographs, films, ceramics, costumes, and textiles. Locals and tourists alike will also enjoy the many special exhibitions. After exploring the gallery, you explore the adjoining High Court of Australia, with its fountains, Carrara marble-paved floors, and murals. 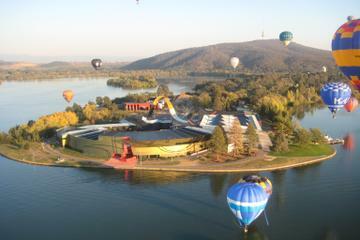 Between the High Court and the National Library on Lake Burley Griffin, Questacon is an interactive National Science and Technology Centre opened in 1988. Parents and children alike will enjoy the interactive science displays and do-it-yourself experiments designed to delight and inspire. The exhibits seek to promote understanding of the importance of science and technology in everyday life. Science shows, special events, and guest lectures complement the 200 hands-on exhibits. In the Technology Learning Centre, budding innovators can participate in workshops and build and play with technology. Highlights of the permanent exhibits include the H2O-Soak up the Science room with water-related fun, the Free Fall slide, and Earthquake House. Near the High Court of Australia and the National Gallery, the National Portrait Gallery of Australia displays some 400 portraits of the nation's most influential people. You can easily spend an hour or two coming face to face with Australia's movers and shakers, brought to life through paintings, photography, and sculpture. Multimedia presentations divulge fascinating details about the lives of the people who helped shape the nation, and special exhibitions provide new things to see. Visiting the gallery is a breeze: parking is free, and the café and bookshop are a great way to top off a tour. Opened in 1968, the National Library of Australia is a treasure trove of Australian books, manuscripts, newspapers, historic documents, oral history, music, and pictures. Its most valuable possessions are Captain Cook's journal (1768-71) and Wills' diary of his expedition with Burke in 1860-61. Architecturally, the building is a dramatic contrast from the National Gallery and High Court. Built in the style of a Greek temple, its classical effect is underscored by the lavish use of marble and travertine on the columns and walls, and marble from Greece, Italy, and Australia used in the decoration of the interior. In the foyer are superb stained glass windows by Leonard French and three Aubusson tapestries woven from Australian wool. The lower floor displays treasures from the library's collection, and the Exhibitions Gallery hosts special visiting displays, which often require advance booking. To really appreciate the layout of this carefully planned capital, head to the lookout of 843-meter Mount Ainslie, one of the city's most popular vantage points. A well-paved walking/biking trail winds for just over two kilometers from the rear of the Australian War Memorial. Along the way, you can pause at the commemorative plaques to learn about historic Australian battles. It's also possible to drive up to the lookout. Thanks to Walter Burley Griffin's vision, the lookout aligns perfectly with Anzac Parade, Lake Burley Griffin, Old Parliament House, and, in the background, the sleek lines of New Parliament House. On breezy days, be sure to bring a jacket. Other popular lookout points include Red Hill, to the south of here, and Black Hill, to the west. About a kilometer west of the city center, the 50-hectare National Botanic Gardens are spread across the slopes of Black Mountain. In the carefully tended collections, you can admire representatives of all the important species of Australian flora. The Rain Forest Gully is particularly impressive. Look for water dragons among the lush foliage. Other highlights include the Red Centre garden, with its red earth and spinifex grassland, as well as the Children's Discovery Walk. The gardens are also a haven for birds and butterflies. From the gardens, you can access Black Mountain Nature Park and hike to the summit for glorious city views. Garden lovers will also enjoy a visit to the National Arboretum Canberra, about a six-minute drive away. This 250-hectare nature area encompasses forests of rare native and exotic trees, the National Bonsai and Penjing collection, a Gallery of Gardens, picnic areas with panoramic viewpoints, and a fantastic children's playground. Australia's only combined zoo and aquarium, this privately owned venture is a hit with families and anyone who loves animals. The National Aquarium displays a wide range of marine life, from the tiny denizens of the reefs to huge sharks. In the neighboring zoo, visitors can view all the important species of Australian fauna as well as exotic species as such as lions, tigers, cheetahs, bears, and more. The animal encounters are extremely popular and allow visitors to go behind the scenes and interact with cheetah, giraffes, sun bears, and red pandas, among other creatures. It's located five minutes from the city center. On a peninsular jutting into Lake Burley Griffin, the National Museum of Australia spotlights the nation's social history in a contemporary space with beautiful lake views. The building itself is a work of art. Inspired by a jigsaw, it was intended to underscore the interconnected stories that helped shape the nation. A major theme of the exhibits is the cultural history of the Aborigines. Other highlights include exhibits on the Gold Rush, Australian industry, clothing, and migration. Children will also find a few interactive displays to keep them busy. On Aspen Island in Lake Burley Griffin, the white Carillon Tower was a gift from the British government on Canberra's 50th birthday in 1963. The 50-meter-high tower incorporates three sleek columns clad in opal chip and quartz. Within the towers are 55 bronze bells ranging from seven kilograms to six metric tons. You can bring a picnic and relax on the surrounding lawns. Better still, visit during a recital (Wednesdays and Sundays from 12:30 to 1:20pm), when the music of the bells wafts across the lake. The tower looks especially beautiful when it's lit at night. Black Mountain Nature Park, to the west of the city center, is a great wilderness experience to combine with a visit to the adjacent Australian National Botanic Gardens. Walking trails wind through the bushland, where you can see many species of native birds and other wildlife. Black Mountain Tower (formerly the Telstra Tower) provides panoramic views of the city. For a fee, you can zoom to the top and sip coffee at the revolving restaurant while gazing out over the city. At the foot of Black Mountain, the Australian Institute of Sport is the training center for Australia's top sportsmen and women, with a swimming stadium and tennis center. The Royal Australian Mint is a great place to spend an hour or so and learn about the heritage of Australia's currency. All Australian coins are minted here. You can watch the manufacture of coins from a gallery, learn about the history of Australian coins through a video presentation and displays, and mint your own $1 coins. In the foyer of the Mint is a small museum with a souvenir shop. Take advantage of the free tour. Luxury Hotels: Smack dab in the Parliamentary Triangle near Questacon, the classy Hyatt Hotel Canberra has a wonderful pool and fitness center and serves high tea in its lounge. Also in the Parliamentary Triangle at the foot of New Parliament House, modern Hotel Realm lies within walking distance of Manuka and Kingston's many restaurants. Trendy Hotel Hotel has views to Parliament House and Lake Burley Griffin and occupies a funky honeycomb building. Inside, it's all smoky hues and mottled light. Mid-Range Hotels: In Kingston, near shops and restaurants, the stylish East Hotel offers excellent value for money - especially for families and extended stays. Its studios and apartments come with fully-equipped kitchens as well as washers and dryers. Also offering spacious apartments, as well as King rooms and spa suites, the sleek and contemporary Avenue Hotel Canberra lies near shopping malls in the city center. Minutes from New Parliament House, the quirky and minimalistic Little National Hotel offers excellent value, with sleek, compact rooms and comfy beds. Budget Hotels: Quality hotels with budget rates are rare near the city center and the Parliamentary Triangle, but both Aria and the Best Western Plus Garden City Hotel, a ten-minute drive from New Parliament House, offer excellent value. More affordable is the older boutique Diplomat Hotel, with free parking, a pool, and plenty of character. About two hours south of Canberra by car are the rugged Snowy Mountains, which rise to a height of 2,228 meters. The mountains are popular year-round. In the summer, the region offers fabulous hiking, horseback riding, water sports, and fishing. In the winter, skiers flock to the popular resorts of Perisher Valley, Thredbo, Smiggin Holes, Charlotte Pass, Guthega, and Mount Blue Cow. At Tidbinbilla, about an hour's drive from Canberra, you can learn about Australia's role in space exploration at the Canberra Space Center in the Canberra Deep Space Communication Complex, one of only three in the world. Budding astronauts can see the largest antenna complex in the southern hemisphere, explore models of different spacecraft, and learn about the foods astronauts eat on the space shuttle. Just south of here, the excellent Tidbinbilla Nature Reserve is a great place to see wildlife such as grey kangaroos, rock wallabies, emus, and koalas. About 40 kilometers south of Canberra, the historic homestead of Lanyon is a lovely spot to spend a morning or afternoon. Set in attractive parkland on the Murrumbidgee River, the homestead recalls 19th-century rural life and is still a working farm with sheep, cattle, and horses. You can step back in time and tour some of the homestead's rooms, filled with antique treasures, or stroll through the beautiful gardens. After exploring the grounds, the café is a great place to enjoy a snack. 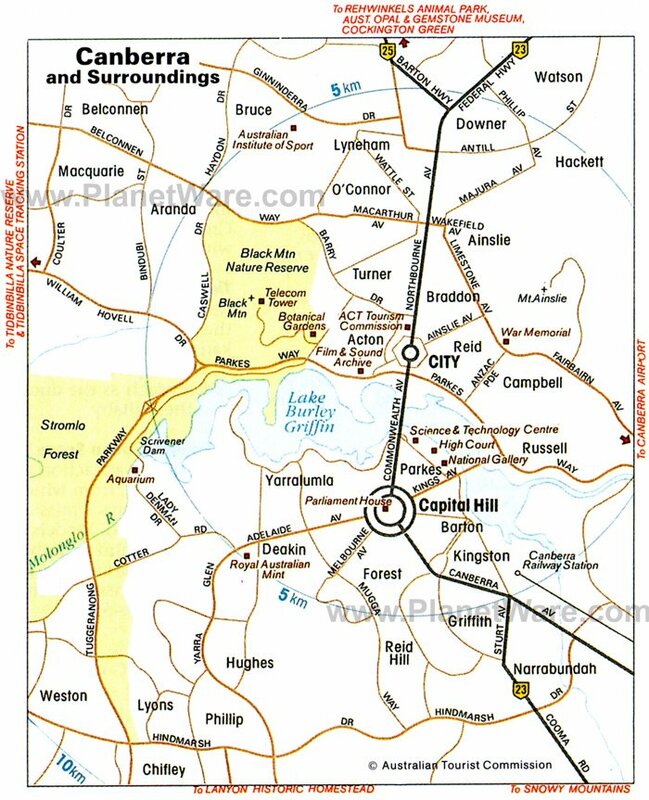 About an hour's drive from Canberra, Goulburn is the center of a wealthy farming district at the junction of the Wollondilly and Mulwarry Rivers. The discovery of gold at Braidwood, 87 kilometers south, brought the town wealth. Today, many handsome buildings bear witness to the town's prosperity in the 1870s. Of particular interest are Riversdale Historic Homestead, the town hall, courthouse, and St. Saviour's Cathedral. Rocky Hill Lookout offers great views over town, and sightseers can visit a WWI memorial here. On the western outskirts of town is the Big Merino, a 15-meter concrete tribute to Australia's wool industry with a small shop and museum. Train buffs will enjoy the Rail Heritage Centre. The little settlement of Berrima was founded around 1830 and is one of Australia's best-preserved Georgian towns. In the last few decades, the beauty of the Georgian buildings has been rediscovered, and the town is now protected as a national monument. Many artists and potters have settled here. It's worthwhile spending a few hours browsing the art galleries and shops and relaxing at the cafés. In addition to a number of old inns, you can explore the historic buildings on the Berrima Heritage Walk. Cockington Green, about nine kilometers north of the city, is a favorite with families. Set amid pretty gardens and sprawling lawns, it's a picturesque English village in miniature, as well as a display of tiny buildings from around the world. Hop aboard the miniature steam train, explore the Waverley Dollhouse, and admire the tiny castles and cottages. Taking an organized tour is a convenient and time-efficient way to see all the top sites in the Australian capital. The full-day Canberra Day Trip from Sydney takes you on guided tours of top attractions like Parliament House, the Australian War Memorial, and the National Art Gallery, with a stop in the Southern Highlands along the way for morning tea. You can also snap a photo of Canberra from the top of Mount Ainslie. Select hotel pickup and drop-off, transport by air-conditioned coach with a live commentary, and entrance fees are all included in the tour. Canberra, the capital of Australia, lies between Sydney (a three-hour drive away) in the state of New South Wales, and Melbourne (a 6.5-hour drive away) in the state of Victoria, where more cultural attractions await. In winter, skiers can carve up the slopes at some of Australia's top ski resorts in the Snowy Mountains, less than three-hours drive away from Canberra, where you'll also find Lake Jindabyne, one of Australia's best fishing destinations, and the Kosciuszko Walk, one of the country's top hikes. If you need help deciding what other things to see and do during your visit Down Under, see our article on top Australian itineraries.